The Israeli defense forces (IDF) will use very skilled reservists to bolster its cyber defense effort. These will be called to share their skills with the permanent staff that is performing the day by day missions. A few day ago the IDF introduced its cyber-defense control center into service in recent days. The development comes as all indications point to a dramatic rise in the capabilities and scope of attacks on the IDF’s digital infrastructure, ranging from state actors to amateur hackers. The control center will be staffed by 20 soldiers, and will enable the army to monitor all attempted virtual attacks. It will stay in close touch with the government’s cyber-defense system. The center will also be in touch with Israel general Security Agency Information Security Authority, which is responsible for securing the nation’s energy infrastructure, financial markets, communications networks and transportation sector against hostile cyber-attacks. 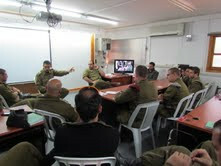 An IDF source said 20 soldiers are insufficient to perform the missions and that others wil, be recruited soon. The reservists are now working in private companies dealin with cyber defense and some served in the IDF intelligence corps where they were trained in relevant skills.